As a southerner, I take pride in my homemade biscuit making prowess. But for the last few years, my boys (the 14 year old and the 40 year old) have really preferred the simplicity of Calumet baking powder biscuits. 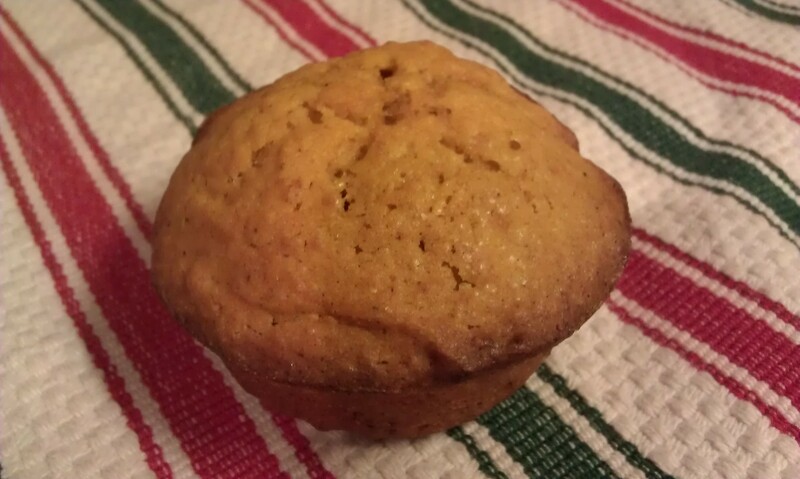 Like with technology, I follow the KISS principle in baking: keep it simple, stupid. I fear the simple days of Calumet are gone forever, though … because I got a kickass new cookbook. The Tupelo Honey Cafe cookbook. And I made the Tupelo Honey Ginormous Biscuits. There’s no going back now. 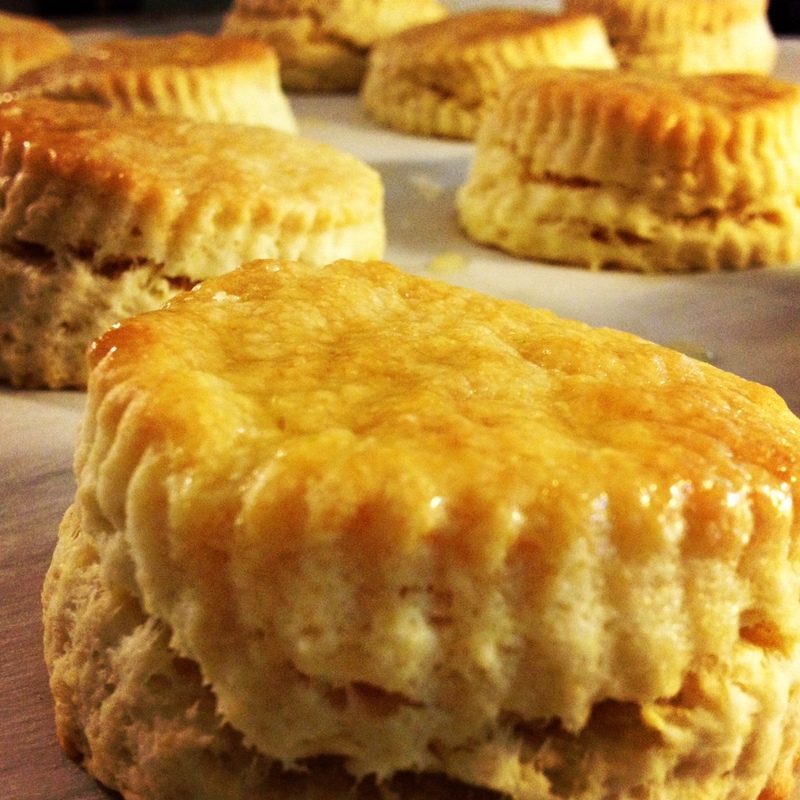 Look at those beautiful biscuits. I did a good job! Imagine recipes for Lemon Vinaigrette (p. 48), Blackberry Skillet Jam (p. 38), Chicken Andouille Stir-Fry with Orange Jalapeno Glaze (p. 134), Chicken Apple Meat Load with Tarragon Tomato Gravy (p. 132), Peach Cobbler with Candied Almonds (p. 215) … and the Tupelo Honey Ginormous Biscuits (p. 189). Did you notice lots of chicken dishes? Since we don’t eat red meat, this book seems to have been tailor-written for us. If you only buy one cookbook this year, give your attention to these “spirited recipes from Asheville’s new south kitchen.” I promise, you’ll thank me. I can’t wait to go back to Asheville so we can eat at the Tupelo Honey Cafe. It’s nice to find some new recipes to try at home, but everything tastes better when somebody else makes it. – – > Are you a cookbook fan? Got any suggestions for can’t-be-missed titles? Categories: Recipes | Tags: biscuits, cookbook, tupelo honey cafe | Permalink. I was inspired during our hiking trip to Arizona last week, to creat a yummy granola-type of cookie that would combine my soul mate’s love of oatmeal cookies, with my need for chocolate inclusion to make the calories worth it. I think I’ve struck the mother lode. For realz. 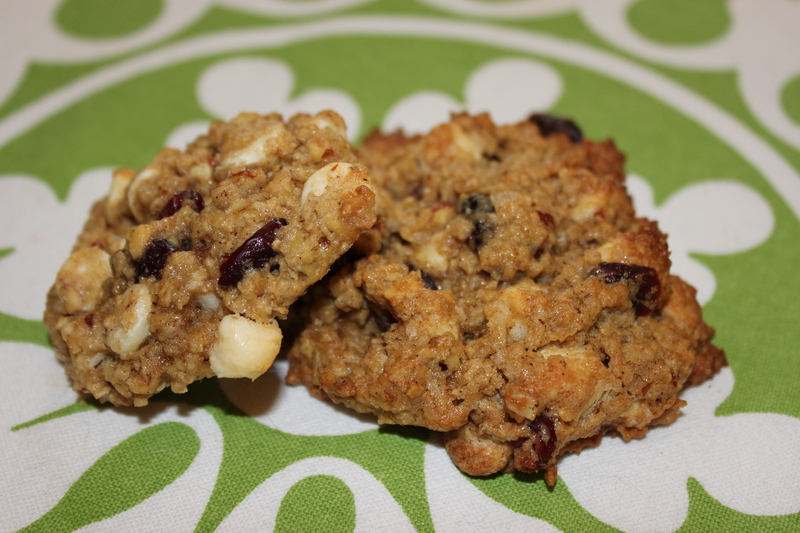 Mix together butter and sugar until creamy, then add egg, and dry ingredients … add the chips, nuts and dried cranberries at the very end to make sure the “cookie” part of the recipe is well-mixed. Line your cookie sheets with parchment, or prepare them however you normally do. Drop cookies 1/2-inch apart–they don’t really spread too much–and pop in the oven. Bake for 10 – 12 minutes, then let cool and enjoy! Make it with a fireman? So I was searching around on YouTube this morning, looking for Tesla’s video for Signs, and ran across my new favorite margarita commercial. Oui, oui, I’d like to make it with a fireman. Wouldn’t you? Categories: General posts, Recipes | Tags: make it with a fireman, margaritas, sauza tequila | Permalink. I am not a dairy person. There, I said it. In all of my life, I know one other person who doesn’t eat cheese, and she’s one of my best friends. Perhaps it’s the weirdness that brought us together. Who knows. My two main sources of dairy-based calcium, though, are skim milk and yogurt. I try to have both each day, though I’m very particular about the yogurt. I can’t just put a spoonful of yogurt in my mouth … yuck! So I like to make parfaits. And I think I’ve perfected them, from simple, healthy ingredients, to fresh seasonal fruit, to cost efficient efforts, I think I have crafted the perfect parfait. 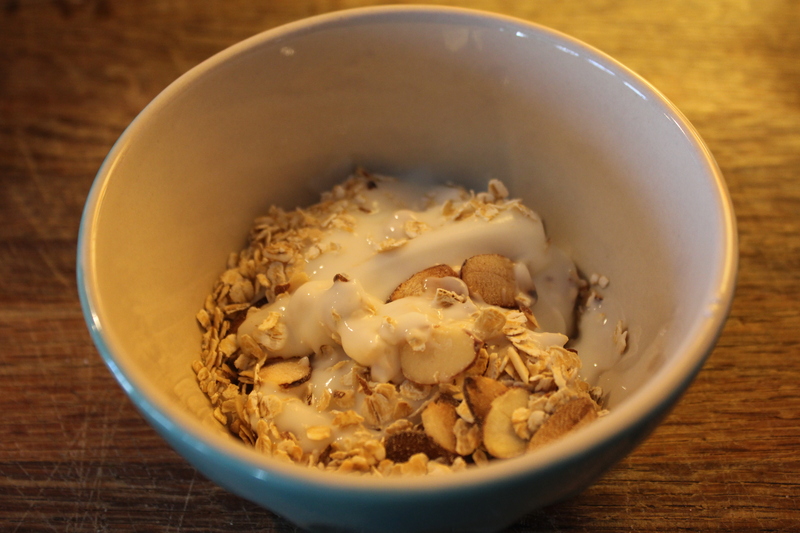 I’ve tried several different recipes for homemade granola, but in the end have come to the conculsion that this basic method is the most tasty and holds up to being mixed in with the granola. The oatmeal plumps up after a minute or two and offers a satisfying texture (while helping to keep your cholesterol low), and the toasted almonds are so yummy. 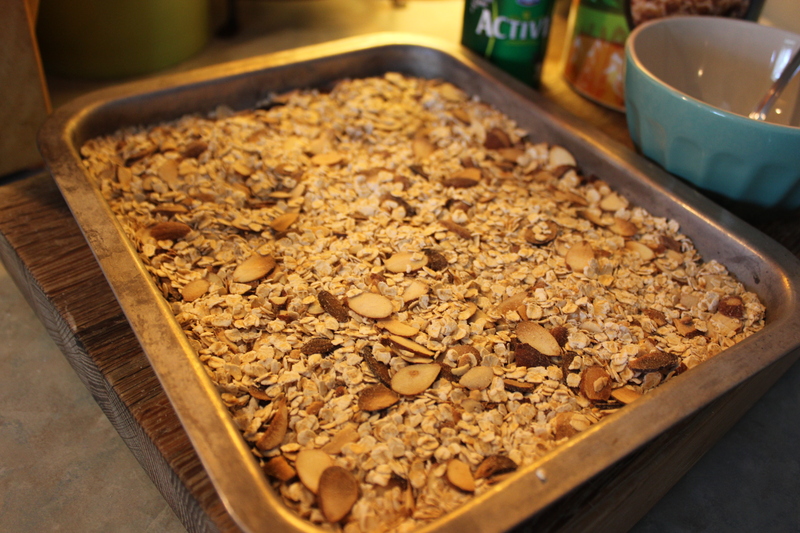 Spread your plain quick oats onto a baking sheet no more than 1/4 inch (‘ish) thick. Add in a handful of plain sliced or slivered almonds. 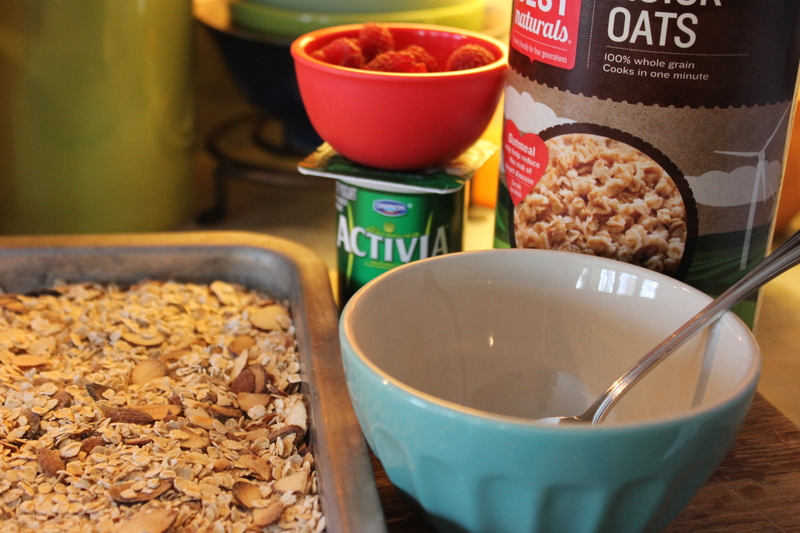 My typical ratio is for 1/2 cup of oats, I use about 1 Tbsp of almonds. I like it nutty. 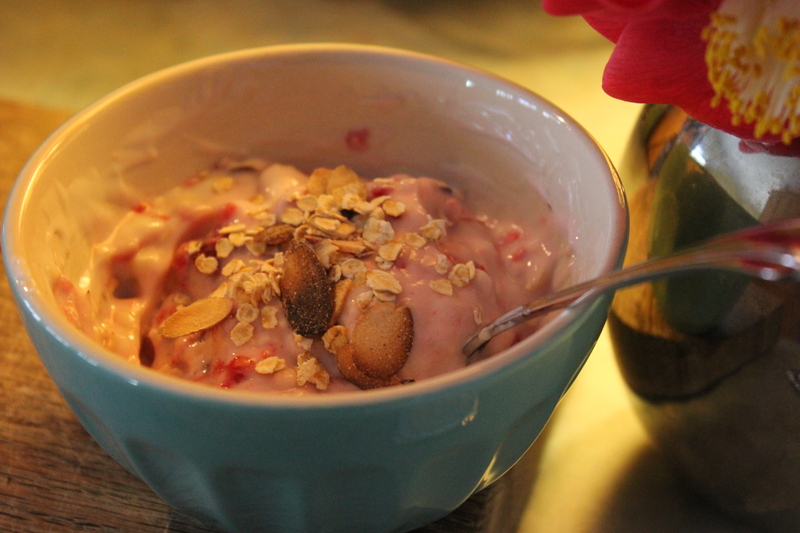 Spoon your yogurt into a bowl deep enough that you can use a spoon to mix it around. Shallow cereal bowls = fail. Sprinkle about 1 Tbsp of your cooled granola into the bowl and stir it in. Add your fresh fruit. When I use raspberries, I like to mash them with my spoon so they break apart and the sweet juice helps to flavor the parfait. My very favorite fruit to add is white peaches during the summertime, but fresh blueberries are also divine! And Wa-la! The Perfect Parfait. 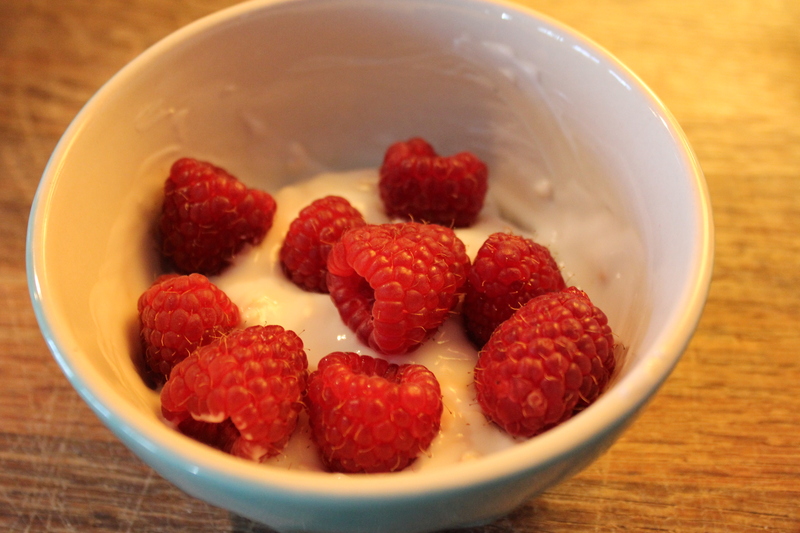 Categories: Recipes | Tags: activia, maple view farms, parfait, raspberries | Permalink. Got any great recipes to share? Categories: General posts, Recipes | Tags: hot chocolate, pancakes, recipes, snickerdoodle cookies, spiced pumpkin bread, sugar cookies | Permalink. There is no better smell filling our home than spiced pumpkin bread. 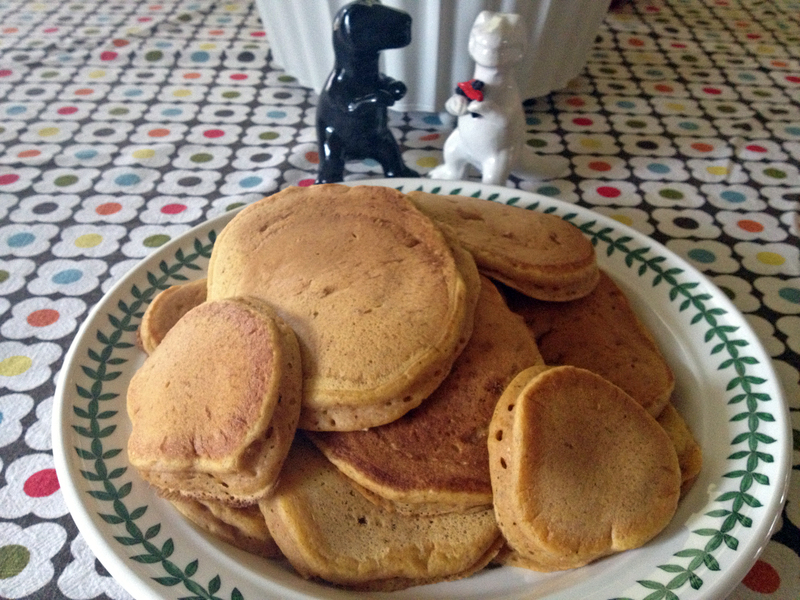 At breakfast yesterday, my son asked if I’d make some and I thought: why not? Seriously, this is like manna from heaven. Preheat the oven to 350 degrees. Butter and flour your pans (I like to make 6 muffins and 2 medium-sized loaves of bread). Beat together the sugar and oil in a large bowl to blend. Mix in eggs, pumpkin and your extracts. Sift in the dry ingredients (flour, cloves, cinnamon, nutmeg, baking soda, baking powder, salt) and blend well. I typically use a large whisk and mix it all by hand. My arm’s killing me by the time it’s done, but I enjoy the process. Scoop the mixture by 1/3-cup measurements into the six muffin cups, and then divide the remaining batter into the two loaf pans. Sprinkle plain brown sugar on the top of the batter (streusel-style). Bake until your cake tester comes out clean when you insert it into the center … about an hour and a couple extra minutes. Transfer to racks and cool completely.